"This business is binary. You're either a one, or a zero. Alive, or dead." In the far flung future, mega-corporations oversee every aspect of daily life, playing with the populace like pawns, while we scrape by in the colony below. Everything is digital, protected and preserved. But no vault is perfect, no defence is infallible. They can't hide their secrets forever. Ghost is coming. The mission is simple: Get in, delve deep and jack out, alive. 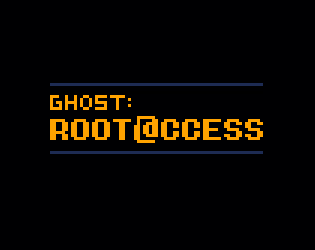 Ghost: Root Access is a roguelike inspired by Cave Noire for the Nintendo GameBoy. You take the role of Ghost, an expert hacker, as you jump from mainframe to mainframe, combating the digital defences in order to collect incriminating data on the mega-corporations that oppress everyone, every day. Delve as deep into the net as you can so you can't be traced, but make sure to keep an eye on your connection HP. Once you die, that's game over for you, and for Ghost. Any key to skip the intro-sequence. Bump into monsters to select them, then Z to attack, or X to cancel. Collecting documents restores some hit points. This game started as an entry for GamesMadeQuick 2018, however it overran, and so the first release is made available as part of Jamuary 2018, following the "Survival" and "Labyrinth" themes. Be warned: If you die in Root Access, there are no retries. You can use the "Abort" option in the context menu to jack out and attempt the mission again.